The leading business intelligence and transaction platform for Africa’s oil and gas sector returned to Cape Town, South Africa and officially kicked off today, November 6, celebrating the event’s 25th Anniversary. Over 200 speakers including 16 Government Ministers, CEOs, Presidents, Senior executives, thought-leaders and delegates within the industry attended the event on course to be hailed as a great success. The 25th Africa Oil Week Welcome Reception sponsored by ExxonMobil was opened by Kent Logsdon, Principal Deputy Assistant Secretary, Bureau of Energy Resources, US Department of State, on the opening night at the Life Grande Café on the V&A Waterfront. Delegates enjoyed local wine tastings from 7 vineyards across the Western Cape Winelands. The Ministerial & VIP Dinner followed that evening and took place at the Zeitz Museum of Contemporary Art Africa (Zeitz MOCAA). 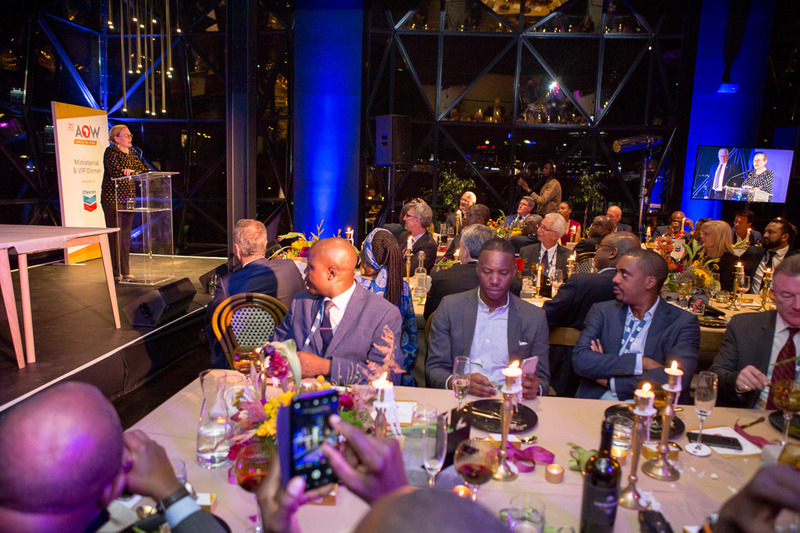 The exclusive invite-only dinner brought together an elite group of key stakeholders who are shaping the future of the African oil and gas market and warmly welcomed delegates with cocktails in the sculpture garden, a three-course dinner and a live dessert display. The dinner was addressed by Chevron, Hon Thembisile Majola, MP: Deputy Minister of Energy, South Africa, and HE Helen Zille, Premier of the Western Cape. Chevron is proud to be the sponsor of AOW’s Ministerial & VIP Dinner, which seeks to connect leaders and generate fresh perspectives. The first of the exciting content programme sessions will begin tomorrow with keynote panels providing the latest insights and knowledge into the Africa oil and gas sector. This includes expert panel sessions outlining Africa’s Economic Outlook, ministerial insights on National Exploration & Production Strategies and African Production Outlooks. The remaining sessions throughout the week will cover various topics including future trends, hot spots and drilling programmes, governance, transparency and equitable growth, to future outlooks and energy transition outlook to 2050. Additionally, Africa Oil Week’s Prospect Forum, held in partnership with the American Association of Petroleum Geologists (AAPG) and supported by PVE Consulting, will allow governments to present their exploration and production opportunities to delegates. Fourteen National Oil Companies (NOCs) and governments, will be presenting open acreage including the Ghana Petroleum Commission, INP (Mozambique) and the Gambia National Oil Company. Africa Oil Week will also host four exclusive bidding rounds and two country roadshows, allowing delegates attending the event unprecedented access to the latest developments that are taking place across the continent first hand. Additionally, networking and social functions will be spread across the five days, providing invaluable networking opportunities for over 1,300 expected delegates and leading experts to meet and build new relationships. Africa Oil Week lead sponsor is Tullow Oil. Other key sponsors include Chevron, Total, Oando PLC, ExxonMobil, Woodside, Impact oil and gas, Shell, TGS, Petronas, Petrolin, Noble Energy, Kosmos Energy, AfricaOil, Nigerian Content Development and Monitoring Board (NCDMB), Department of Trade and Industry (the dti) South Africa, Minister of Petroleum & Gas, Sasol, Anadarko Petroleum Corporation, Cairn Energy, Oryx Petroleum, Maersk Drilling, GardaWorld, Eni, Veolia Group, Seplat Petroleum Development Company Plc, Friburge Oil & Gas, Latham & Watkins, IHS Markit, Schlumberger. Bronze sponsors include Azinam Limited, Africa Oilwell Technology (AOT), ION, Deloitte, Herbert Smith Freehills, Namcor, Worley Parsons, SAOGA, The Saldanha Bay Industrial Development Zone, Petroleum Agency, SA, National Oilwell Varco. Contributing sponsors include, ACAS-Law & Discover Exploration. Africa Oil Week takes place at the Cape Town International Convention Centre in Cape Town, South Africa on the 5-9 November.